Javerre was a Grade 3 winner on the track. Photo by Jim McCue, Maryland Jockey Club. Is there life after racing? Fortunately these days there are a number of avenues open for thoroughbred racehorses who retire from competition. One path that allows these former stars to start a second “career” and stay on the backstretch they love is working as a pony. In Maryland there are a number of retired stars – and some who weren’t much at all on the track — who have taken such a path. Take Javerre. Javerre had a long and successful career as a race horse. 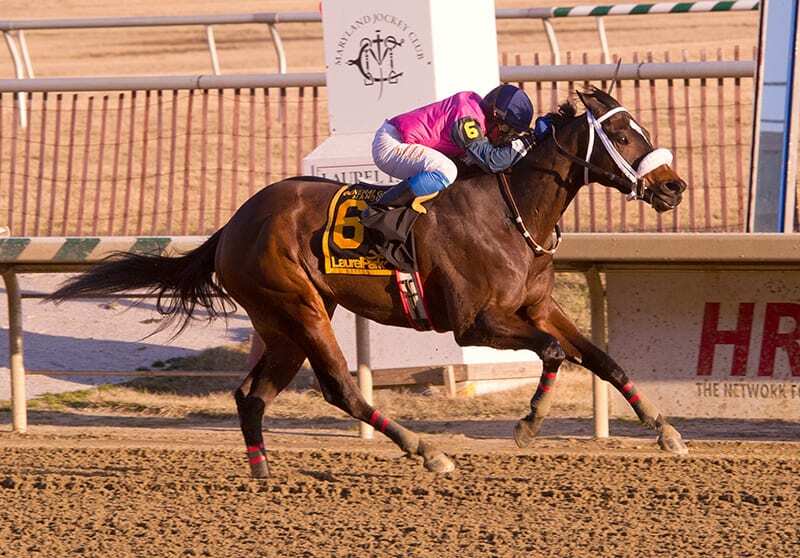 The New Jersey-bred Outflanker gelding won seven of 37 starts in a career that spanned over five years and earned some $490,081. 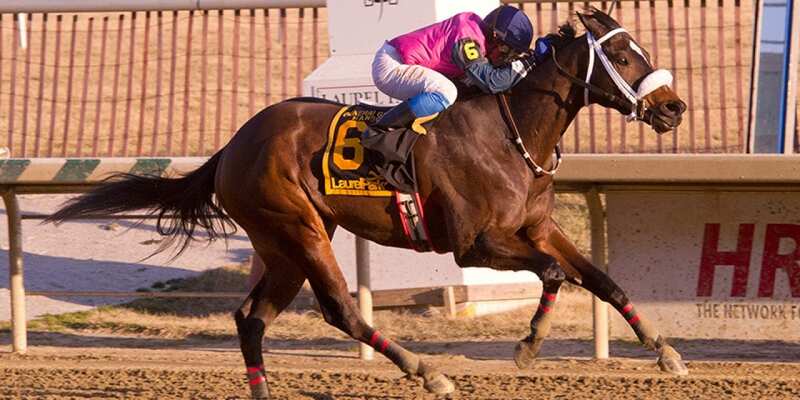 He is best remembered for his win in the 2013 Grade 3 General George Stakes Stakes at Laurel Park. Cathal “Cal” Lynch trained Javerre for Smith Farm and Stable during his career, and Lynch recalls that when it came time to retire Javerre his first thought was to convert him to a stable pony. “He’s just such a cool horse to be around. He has a great personality, and I just thought with his temperament and outgoing way he’d make a good pony,” Lynch reported. Javerre was given some eight months to wind down, then Lynch sent him to be “broke” for the second time in his career. But that doesn’t mean the racehorse doesn’t come out in the nine-year-old. Lynch said Javerre’s personality makes him fun to be around. Training a retired race horse to be an outrider’s pony isn’t easy. Horses are trained to go fast but they’re not trained to stop quickly so getting a former racer to run down a loose horse then pulled them up in a short distance is not easy. Some former racehorses end up as important members of the outriding crew at Laurel and Pimlico. Big Pow Wow, known as “Big” by his owner, outrider Lisa McClevin, won twice in a 13-race career. According to McClevin “Big” is a natural ham. He loves kids, McClevin says, and also the limelight. “He loves children and sticks his tongue out when you tickle his nose,” she reported. Now called Sharky, Great White was winless in his 11-race career. On his way to the “killers” a number of years back, he was rescued from that fate and eventually retrained as an outrider pony. Now “Sharky” teams up with former trainer and current outrider (and on-air handicapper) Tim Tullock and can be seen at the races at Laurel and Pimlico. Of course, these are just a few of the many Thoroughbreds who find their new homes just down the shedrow from their old ones. It’s one way the industry can benefit from the unique skill set that Thoroughbreds possess even when they can’t compete any longer on the racetrack. 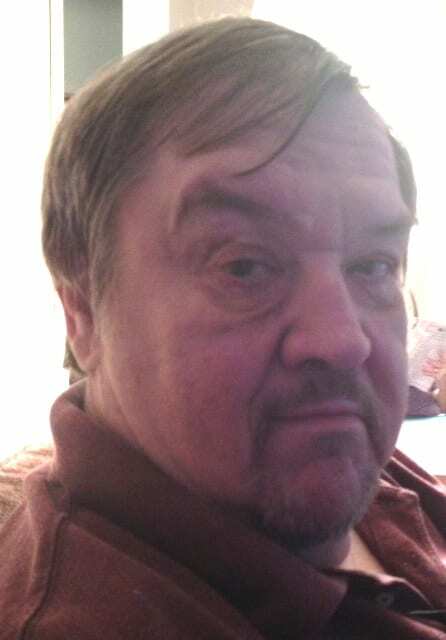 Dottie Miller contributed to this story.